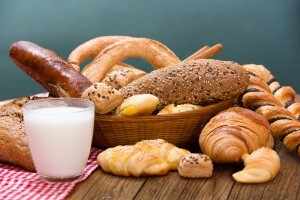 Carbohydrates are the body’s main source of energy. When carbohydrates are broken down by the body, glucose is formed, which is essential to fuel, build, and repair the body. There are complex carbohydrates and simple carbohydrates, also known as sugar. Each has a vastly different effect on the body. Complex carbohydrates consist of three or more sugars and are fiber-rich. They may also be referred to as dietary starch and include whole-grain breads and cereals, pasta, corn, green vegetables, beans, lentils, peas, and potatoes. Simple carbohydrates consist of only one or two sugars and include white flour, table sugar, brown sugar, honey, maple syrup, jams and jellies, fruit drinks, and candy. There are foods that contain naturally occurring sugars include fruits and many vegetables, milk products, honey, maple sugar, and sugar cane. Unlike simple carbohydrates, complex carbohydrates contain indigestible dietary fiber. Dietary fiber is only found in plants and can be defined as soluble or insoluble. Soluble fiber is found in such foods as oats, barley, beans, peas, apples, strawberries, and citrus fruits. Soluble fiber binds dietary cholesterol and carries it out of the body, thus preventing it from entering the bloodstream where it can accumulate in the inner walls of the arteries causing high blood pressure, heart disease, and strokes. Insoluble fiber, found in vegetables, whole-grain products and bran, provides roughage that helps to speed the elimination process. This decreases the time that the body is exposed to harmful substances, possibly reducing the risk of colon cancer. Conversely, the body rapidly absorbs simple sugars, which are added to processed foods such as candy, cookies, and cakes. This rapid absorption causes glucose levels to spike, and then rapidly decline leaving a person feeling irritable and nervous. These processed foods not only contain large amounts of sugar, but are usually high in fat and provide empty calories without essential nutrients our bodies need. Based on this information, it’s obvious that we want to include complex carbohydrates in our diets and, avoid simple carbohydrtaes as much as possible.